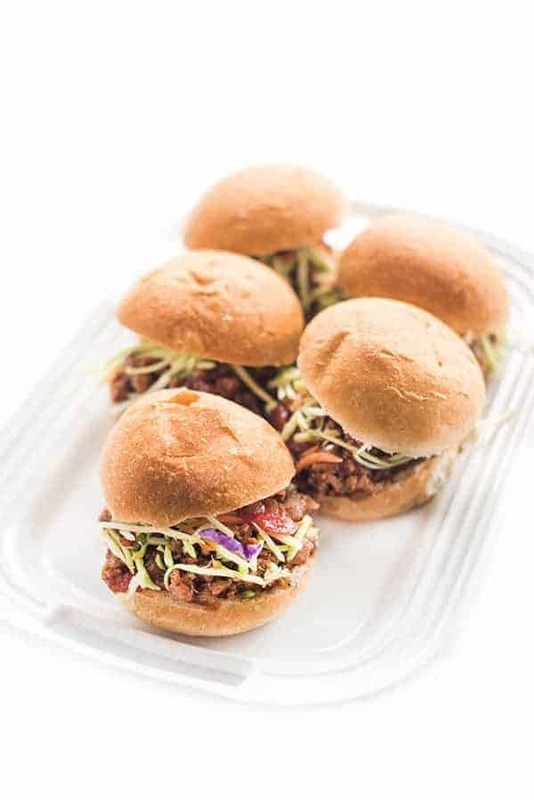 A modern twist on the childhood classic, these sweet and smoky turkey sloppy joes are served in a crisp lettuce cup for a naturally gluten free spin on America’s favorite sandwich. I know people always say this but losing weight has been so much harder and slow going after baby number 2 than it was after my first. I am constantly having to take a step back to reevaluate my nutrition and fitness routine as I work to break through one plateau after another. One trick that always seems to work is increasing the percentage of calories that come from protein in my diet. 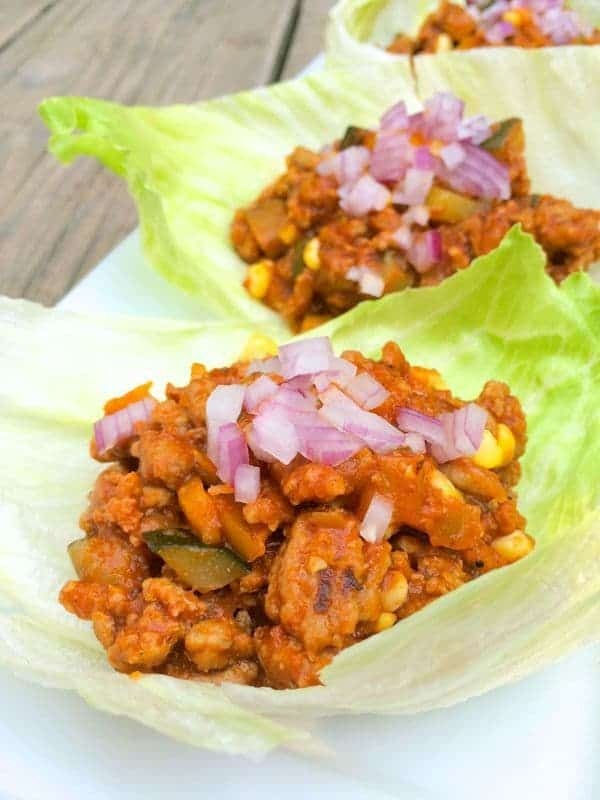 These Turkey Sloppy Joe Lettuce Cups started out as a “clean the fridge” late summer dinner using up a head of iceberg, zucchini and corn but they ended up being one of the most delicious, FAST dinner ideas to date. 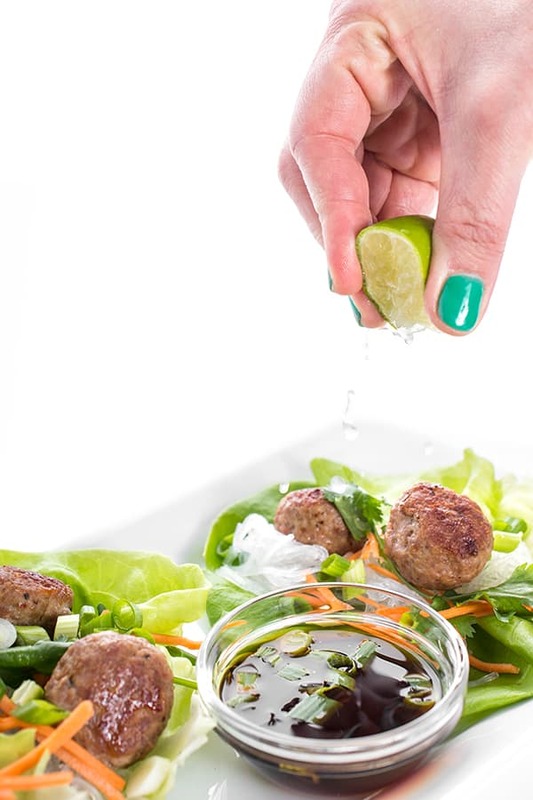 Naturally gluten free and packed with protein, these lettuce cups were a huge hit and totally fun to eat. The minced red onion added a hint of spicy sweetness to every crunchy bite. A little sriracha on top never hurts either. A modern twist on the childhood classic, these sweet and smoky turkey sloppy joes are served in a crisp lettuce cup for a naturally gluten free spin on America's favorite sandwich. Heat a large, deep sauté pan over medium-high heat and spray with cooking spray. Add ground turkey and begin breaking up with a wooden spoon. While turkey is browning, dice up the onion, garlic and zucchini then toss into the pan. Stir occasionally while meat continues to brown and veggies begin to soften. Add Worcestershire, steak seasoning and smoked paprika to the pan and continue cooking until most of the liquid evaporates, about 7-9 minutes. Add tomato sauce and barbecue sauce to the pan and bring to a boil. Stir then reduce heat to low to simmer. Stir in corn then continue to simmer on low for 10 minutes. Check for seasoning before serving in iceberg lettuce cups. Garnish with red onion if you wish. This was really easy! I didn’t have an onion on hand so I used a red bell pepper — still delicious. I’ll definitely make it again in the future as it came together in less than 30 minutes. LOVE the sound of these! Sloppy Joes are something that I never really had as a kid, but now that I’m an adult, funnily enough I’ve had them a few times and love them, so I’ll have to try them with lettuce cups! You know I didn’t either and I swear I love them more now as an adult! I’ve been reading a lot about healthy nutrition lately, and the bottom line I’ve gotten is that protein is the key to losing weight, especially if you cut back on starchy carbs. And sugar. Protein is far more satisfying than fast carbs and does not create cravings like those carbs do. I wish you the best in your quest to lose the extra weight. Yes exactly. :) Thank you Susan! haha I couldn’t stop myself! 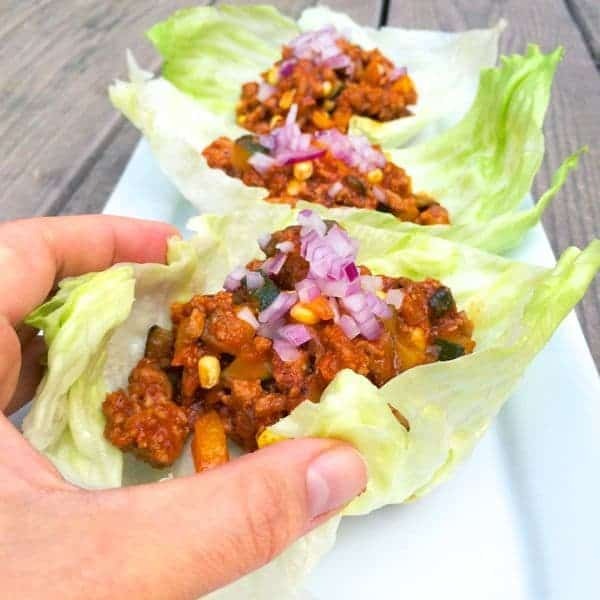 I love sloppy joes and I never use a bun anymore but I like the idea of putting them in a lettuce wrap. I hear you about losing the baby weight. After child #1, the weight came right off. Then there was child #2 that I gained more with in utero and never managed to get all of that weight off. Then there was child #3 where I only gained 12 pounds while preggars but the weight is just stuck there it seems. Anyways, thanks for the wonderful idea. I am a protein Nazi. My hubs will just eat cereal for breakfast, and I’ll be like NO…you must have Greek yogurt too, protein! So these? These are my JAM! Pinned! These look delicious! Using lettuce instead of bread or buns is a great idea! Yes I am loving lettuce cups lately!! Lettuce wraps always make me feel so healthy! I love that you combined sloppy joes + lettuce! You and me both Kelly! If I ever ask Larry – what do you want me to make for dinner – he always says SLOPPY JOE’S! It’s a given. :) These look perfect. I love the lettuce cups! No way really?? That’s so funny!! Make these for him! looks delish!! Can’t wait to make it for my lunches! Absolutely adore these, Liz. Sloppy Joes have been a go-to for me lately. 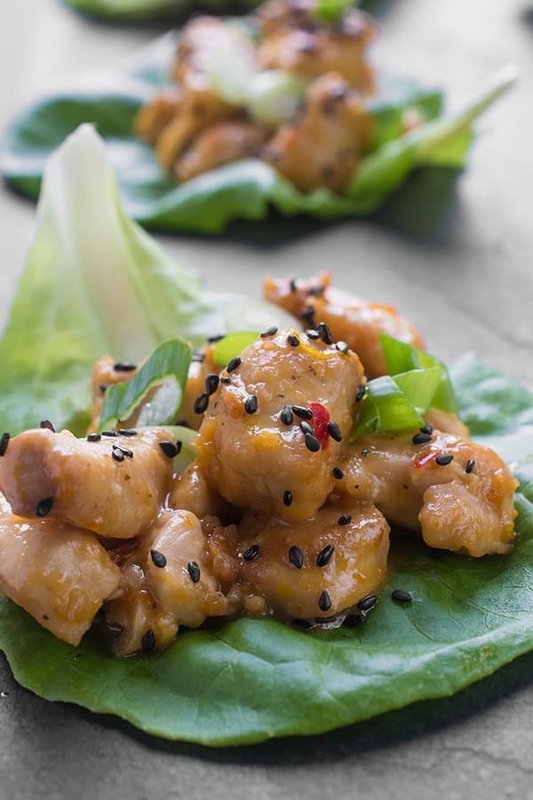 Serving them in lettuce cups is total genius! Thanks so much Cassie!! We hadn’t had them in AGES! This looks fantastic, Liz! 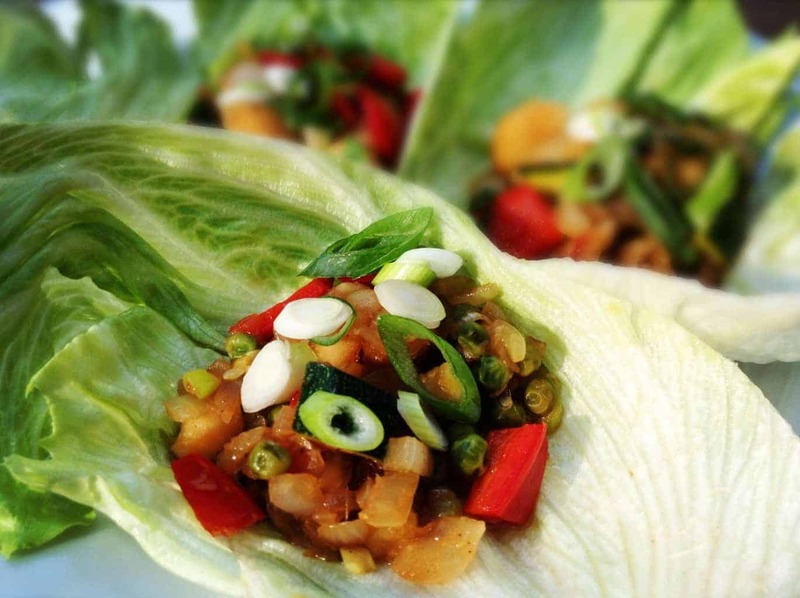 We love lettuce cups!